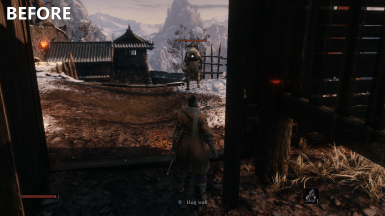 Removes several unnecessary or annoying HUD elements to create a cleaner and more immersive feel. 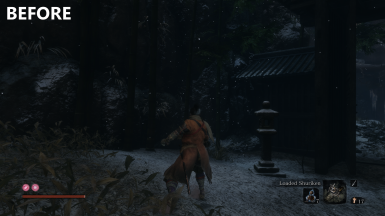 Sekiro Mod Engine Required for the game to load modified files. If you want to use part of this mod in your own I will likely approve it as long as your mod is an original idea and not just a re-upload with minor tweaks. Please ask permission first. Katalash - Native PS4 Button, used as part of this mod. TKGP - For making tools to make modding this game possible. Katalash - For making Mod Engine, so modding is easy and efficient. Options Pack A variants: Removed a button prompt for something that is later in the game. Options Pack A2: Removed text for a few more interaction prompts. Options Pack C variants: Changed the smaller grapple icon to be a smaller version of the vanilla icon, except without the arrow. Since there is no longer an Options Pack B, changed Options Pack C to B and D to C.
Unnecessary Icons module: Changed the method used to remove the auto-save icon so it doesn't also remove the blue flame used on the main menu and loading screens. Backgrounds module: Removed the background behind the spirit emblems in the lower-right corner. Options Pack A: Added a variant that removes the text (but still displays the button icon) for common interactions (open door, pick up item, etc). Some uncommon or ambiguous interactions still have text to make it clear what the action is. Options Pack B that was available for version 2.0 has been uploaded as its own mod with new features and options. 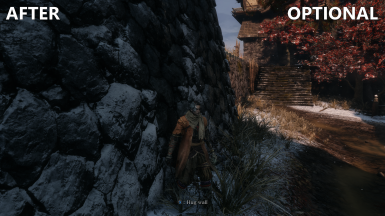 Added a new Options Pack B that removes subtitles and the background fade behind them. The old Options Pack C variants have been split up to be Options Pack C (smaller icons via texture edits) and Options Pack D (texture removal using a different method). You can use one variant from each option pack type, giving you even more freedom to choose which features you do and don't want to use. 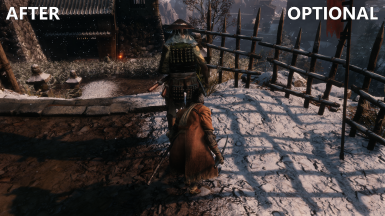 For the full-screen overlays that are used after certain events (death, unseen aid, shinobi execution, etc), addded the option remove the kanji (Options Pack D1, D3, and D5). 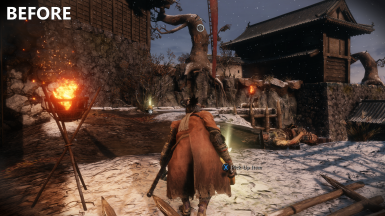 Options Pack C1, C3, and C5: Changed the ninjutsu deathblow prompt to use the same smaller icon that regular deathblows use. 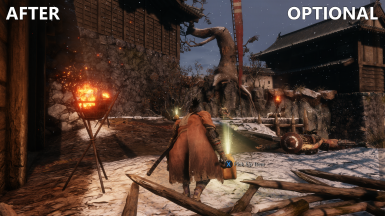 Options Pack D2, D3, D4, and D5: Removed the ninjutsu deathblow prompt. Completely redesigned the mod from scratch. 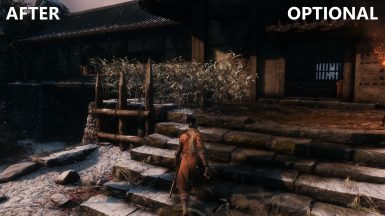 The main files now use the game's layout files to remove textures, and the optional files only edit the actual texture files primarily for changing textures. I split the mod up into four modules and a selection of additional extras. This will allow each person to have a lot more freedom to choose which features they do and don't want. Added an optional file for removing some of the kanji that appears above the player's head in certain situations. Changed the icon used as the smaller icon for grapple points. It is now just the vanilla game's icon without the outer ring and giant arrow. It is also an optional extra now. Added support for low graphics settings. 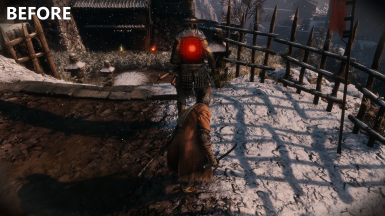 Enemy Indicators: Removes the icons and meters that show how aware enemies are of the player's presence, and whether or not they're hostile. 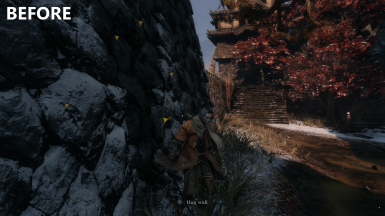 Vignettes: Removes the black vignette used when the player is hidden, crouched, or wall hugging. 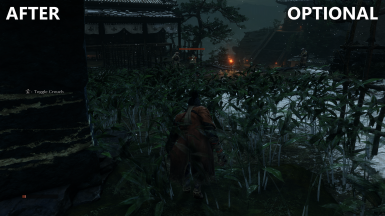 Also removes the red vignette used when the player is low on health or on the resurrection screen. 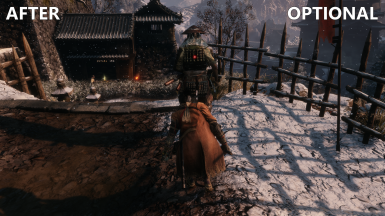 Unnecessary Icons: Removes the icons that show interactable objects from a distance (not the interaction prompts when you're right next to them), the auto-save icon, the checkmark showing you've eavesdropped on NPCs (because it shows from a much longer distance than the prompt), and the icon the shows if an item you've picked up went to storage rather than your inventory. 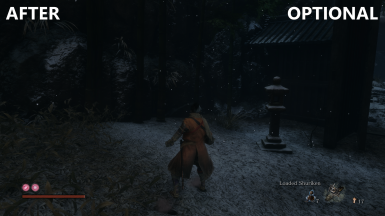 Backgrounds: Removes the backgrounds behind certain text and icons to give the HUD a much cleaner and open feel. 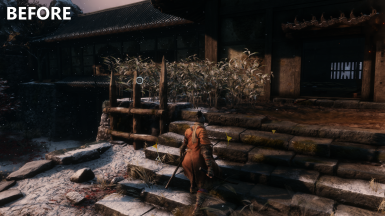 Note: Because this mod uses the same file as Katalash's popular Native PS4 Buttons mod (and he was kind enough to allow other modders to use his mod), each variant of this mod includes a version for the default controls and a version for DualShock 4 controls. These are all standalone, so one variant of each letter can be used in addition to one of the main variants of the mod, or on their own! 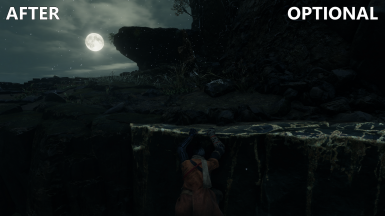 A1: Removes the button prompts when wall hugging and ledge climbing. All other button prompts are unchanged. 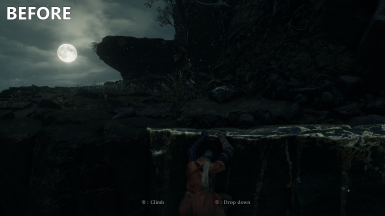 A2: Removes the button prompts when wall hugging and ledge climbing. Also removes the text (but still displays the button icon) for interaction prompts. B1: Smaller target lock-on icon. B3: Smaller target lock-on and grapple icons. B4: Smaller target lock-on icon and deathblow prompt icons. B5: Smaller target lock-on, grapple, and deathblow prompt icons. 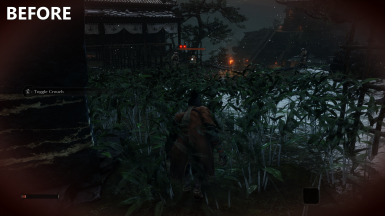 C3: Removes overlay kanji and deathblow prompts. 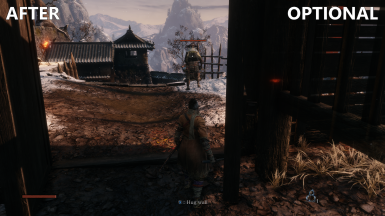 C4: Removes deathblow prompts and the icons showing number of deathblows required to defeat an enemy. 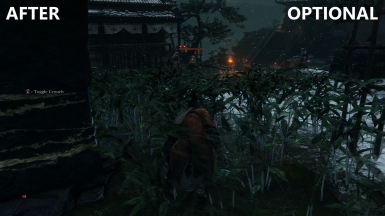 C5: Removes overlay kanji, deathblow prompts, and the icons showing number of deathblows required to defeat an enemy. Just put extract the .zip archive and move the menu or msg folder into Mod Engine's mods folder. I appreciate all feedback and will consider all suggestions to help improve this mod as much as I can. This mod is opted-in to earn donation points. All of my donation points are automatically converted to money donations for Child's Play.